Bigg Boss 10 6th January 2017 Day 83 Episode details are here. The season 10 of Bigg Boss is getting even more disgusting with each day. Om Swami stooped to a whole new and too low level. During the captaincy task, Om came up with a pot filled with his urine, and he threw it on Bani J, Rohan Mehra, and others. He stooped to get into the captaincy game. In the task, Bani J and Om Swami were competing to become the new captain of the house. In it, the remaining contestants of the house were to destroy the pyramids of Bani J and Om Swami by throwing squishy balls at them. They were given the option to destroy the pyramid of the contender who they don’t wish to become the captain by staying outside the border line. The pyramids were the pictures of Om and Bani J placed on a table. Both of them had to protect their respective ones. They were given the power to build it all over again. The contender with the maximum blocks standing in shape of a pyramid was to be declared as the winner. Om Swami lost it badly. After losing the task, he started sulking instead of playing. Then, the horrible incident took place due to which the housemates got angry with Om Swami. OmSwami shook everyone with his act. He fell so low for a task. Right after his shameful act, rest of the contestants locked him in the jail and requested Bigg Boss to throw him out of the house immediately. Bani and Rohan cried a little while discussing the incident. Bani threw the mic after deciding that she wouldn’t participate in further activities. She urged the Big Boss to take a strict action against him and said that she wouldn’t participate until an action has been taken. Rohan asked her to wear it back, but she didn’t. After a while, Big Boss called everyone in the living room for an announcement. 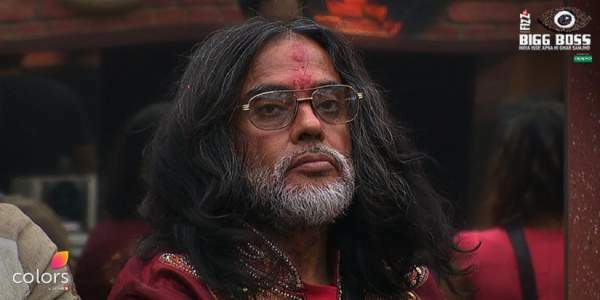 In the living room, bigg boss said that Om Swami’s actions were shameful and disgusting. Interrupting, Om Swami complaint that everyone else is mistreating him in the house. The today’s upcoming episode will witness Big Boss announcing Swami to leave the house immediately. However, Swami Om refused to do so. Later on, BB was forced to send in security to threw him outside the house. Instead of going outside with the guards, Swami locked himself in the jail washroom. A lot of drama will unfold tonight. Be sure to watch it. Salman started the episode with a disconcerting note. He condemned Swami Om for his actions. He felt that BB took the right decision to expell him from the show. Later on, Salman put Manu in the spot and asked him some questions. Other contestants and Sallu gave him a stern reaction. Salman suggested Bani to become mature. He condemned his immature actions like throwing mic away. Bani explained her stand. He urged Bani to stay strong and don’t get baffle from person like Swami Om. After going out, Swami called Salman Khan an ISI agent and made some other shocking revelations like Bani slept with someone for four days and drugs are supplied to female contestants inside the house, etc. Feel fee to share your views with other readers and us via commenting below. Who will be the bigg boss 10 winner?